You may think the Abyssinian Guinea Pig is having a 'bad hair day', but it is the unique coat that makes this guinea pig stand out! The Abyssinian Guinea Pig has quite the distinctive look. They have a fur pattern consisting of 8 to 10 hair whorls, called rosettes. You could say that they always look like they're having a bad hair day, but that is just part of their charm. Despite the wild patterning of their coat they tend to keep themselves clean, and they require minimal care. The Abyssinian is often kept as a pet. Many become pets due to the difficulty of finding ones that are suitable for showing. Abyssinians are great pets for children, or adults who are first-time guinea pig owners. This breed is known for being rather mischievous. But its friendly personality and tendency to clown around more than make up for any trouble it gets into. They can learn to come when called and get into their cages unassisted. Some can even learn to sit on command. Background: It is believed that Guinea Pigs were first domesticated as early as 5000 BC to be used as food. Selective breeding began around 1200 AD. They subsequently became coveted as pets by the upper classes and eventually made their way into the homes of the common man. Abyssinian Guinea Pigs were among the first breeds to be recognized by the American Cavy Breeders Association. The breed has since improved significantly. Description: The most recognizable trait of the Abyssinian Guinea Pig is its rosettes. These are cowlicked patches of hair that cover most of the animal's body. Ideally, the Abyssinian should have one rosette on each shoulder, four across its back, one on each hip, and two on the rump, for a total of ten. However, Abyssinians with at least eight rosettes are eligible for showing as long as the pattern is symmetrical. 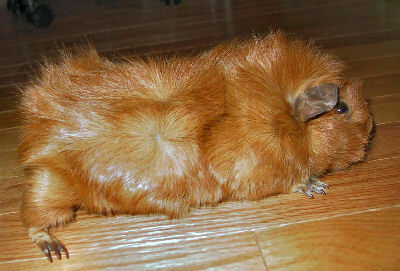 The Abyssinian Satin Guinea Pig has particularly silky, shiny hair. It is very fine and dense, and enhances the entensity of their colors. Color differences: The Abyssinian Guinea Pig can be found in a wide variety of colors. The agouti coloring is particularly stunning on this breed due to its rosettes. Availability: Abyssinian Guinea Pigs are fairly common among breeders, and may be found in pet stores. Prices vary. Rabbits are a lot stronger than guinea pigs and can easily hurt or even kill a guinea pig without meaning to, simply by kicking out with their powerful back legs or jumping over the guinea pig. The rabbit may also bully the guinea pig. Sometimes guinea pigs ingest rabbit fur which can cause them problems. I have an Abyssinian Guinea Pig (Pretty Girl) and a American Satin Guinea (G-Force). Pretty Girl & G-force are six months old and Pretty Girl is pregnant for the first time, not sure how many pups she'll birth but all pups will be for sale. The estimated due date 4/24/2015. Where are you located if I were able to purchase a guinea pig? We are interested in finding 2 female pups, do you currently have any? If so, where are you located? Looking for a show quality Abyssinian sow 4-12 weeks old.